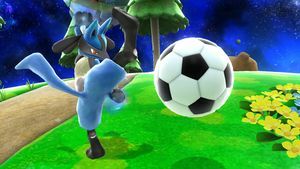 Lucario prepares to kick a Soccer Ball. The Soccer Ball (サッカーボール, Soccer Ball) is an item that appears in Super Smash Bros. Brawl, Super Smash Bros. 4, and Super Smash Bros. Ultimate. It is called Football in the PAL version of Smash 4, but retains name Soccer Ball in all versions of Brawl. 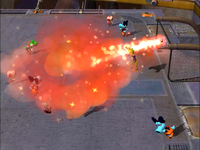 A super strike in Super Mario Strikers. This item is based on the Super Mario Strikers version of a soccer ball. When a team captain is in control of the ball, the player can hold the "B" button to perform a "Super Strike", a powerful move that launches the ball violently towards the net; if the player manages to pull off the super strike perfectly, the ball is unstoppable and knocks the goalie into the net, earning the player double points. When this move is performed by Mario, the ball is surrounded by red fire. The trophies for the Soccer Ball item also connect it with Soccer for the NES, Nintendo's first soccer-based video game, rather than strictly identifying it with the Mario Strikers games. A soccer ball launched at a player with a Falcon Punch. The Soccer Ball cannot be picked up, but can be knocked around with attacks. 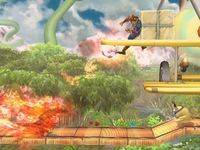 In Brawl, a decently strong attack will cause it to catch fire and be launched diagonally upwards in the direction of the attack. The more powerful the attack, the further and faster the Soccer Ball will be launched, and the harder the hit from it will be. Powerful attacks can launch the ball through huge distances and deal huge damage and knockback, enough to KO most characters at low damage percentages, with extremely powerful attacks such as a Home-Run Bat swing giving the Soccer Ball OHKO power. As Soccer Balls take more damage, they will travel farther distances and deal more damage and knockback. The ball cannot be stopped while it's flaming, but it can be reflected. It will also bounce off of set Bumpers. Once the ball would be expected to start slowing down, its fire goes out and it stops immediately, falling straight downwards to the ground harmlessly. In SSB4, Soccer Balls demonstrate more realistic physics and do not have to be on fire or on a straight trajectory for it to be damaging; any ball that is moving as a result of a player attacking it will have an active hitbox until it slows down enough. In addition, any Soccer Ball that falls off the stage will immediately teleport back onstage in a random spot, making it the only item that cannot be disposed of by moving it past a blast line. A Soccer Ball will only disappear once its natural timer for its duration in play expires; moving a Soccer Ball past a blast line does not reset this timer. Apart from this physics change, Soccer Balls in SSB4 deal considerably lower knockback, no longer being capable of low percentage one-hit KOs even if hit by extremely strong attacks (such as an aerial reverse Warlock Punch). An attack item that flies when struck and explodes as it bounces, causing damage to whomever it hits. As it's a soccer ball, you'd think hitting it with your hands would be against the rules, but that's not the case. Unleash your fiercest attacks on it. Really, it's OK. The ball's design seems old fashioned, but it sure does bring back lots of soccer memories, doesn't it? The Soccer Ball trophy appears in both versions. In Super Smash Bros. for Wii U it is part of the Brawler Trophy Box. A strong attack on a soccer ball will set it on fire, and any enemies hit will go flying from the impact. Depending on how you hit it, the ball will fly in different directions. Luckily, no one has to retrieve it if you send it off the stage-this ball will return to the battlefield for some time. Attack a football to ignite it and send it blazing through the air into any hapless foe in its path. The direction it goes in depends on how you attack the ball, so put some thought into it to cause some devastating effects. The ball comes back if you miss, so try as many times as you need to! Brawl's trophy refers to the Soccer Ball's design as "old-fashioned" as a reference to the actual soccer balls used for the FIFA World Cup; while the standard truncated icosahedron shape was used starting in 1970, this design was discontinued starting with the 2006 incarnation of the tournament. In Training Mode, if Soccer Balls are spawned right into one another and attacked, they will launch further than a ball on it's own since the burning balls will hit balls that stop burning, reigniting them and repeating the process. This page was last edited on March 25, 2019, at 10:53.